Coming up with ideas on what to blog about can be crazy hard. I get it. Been there. It is super discouraging when you can’t think of anything. Ultimately, you just want to give up, or you end up creating blogs that don’t really get any traffic, or do any good. Which then makes you even more discouraged. It’s a bad cycle to get into. So, as you know, this year I have been putting all the effort into blogging. My goal is to blog once a week! Once I accomplish that goal, I will move to blogging twice a week. Now, that is a crap ton of content. How in the literal heck do you come up with all those ideas? So, I have been on a mission to come up with blog post ideas. I figured, if I am having a hard time coming up with ideas, then you might be too. So, I wanted to help. Ultimately blogging is so important for photographers, I just don’t want you to give up and get discouraged. Here are a few thoughts, plus at the bottom of my thoughts you will find the ultimate guide to blogging and 130+ blog post ideas! If you have any additional ideas make sure to comment below. Let’s create a community and help eachother out! So, I pretty much created an entire post on this topic. It is called ‘Do Photographers Need To Blog’. If you haven’t done so already make sure to head on over and read that post. It has a ton of information in there for you. Your writing is too stiff. You need to be personable. Be yourself and be authentic. Your topic is too broad. You really need to pick one topic to write about and stick to that per blog post. You think you are done once the writing is done. This is sooooooo wrong. You have to share your content and then share it again! The killer of all blogs. You seriously need to blog consistently. I am learning this to be fact this year. I started blogging consistently and man has my everything increased. My website is getting more views, I am getting more comments and shares, and my business is bringing in more money! We always hear that each blog needs to be 300 words. Well guess what, that is just a minimum. It has been proven that blogs with over 1000 words do so much better. It is best to strive for blogs reaching 3000 words! I know, it is like a small essay, but believe me it is worth it. Want More Blogging Tips? Check these out. Realize that it will take a long time to get the hang of it, so don’t be so hard on yourself. It is Free Friends! 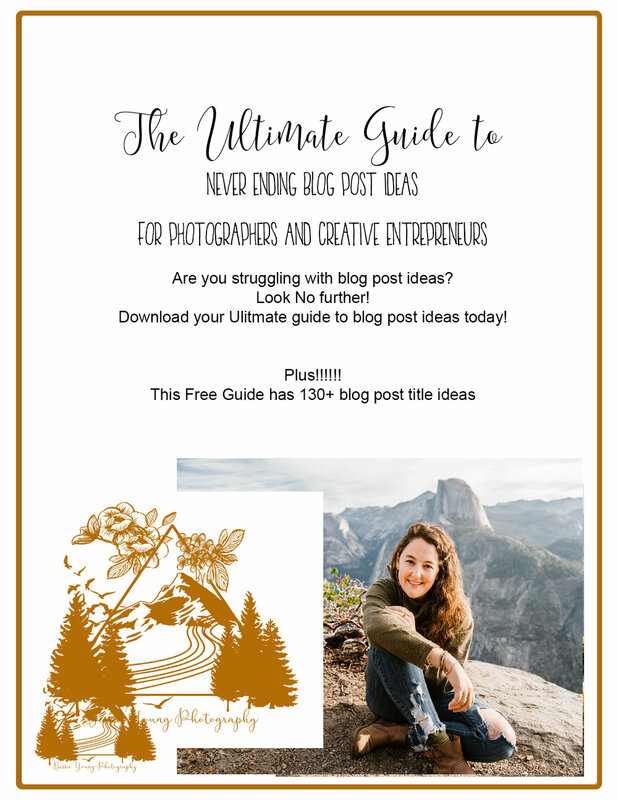 I have created the ultimate Get the Ultimate Guide to Blog Post Ideas for Photographers and Creative Entrepreneurs! Thank you so very much! I can’t wait to chat with you about all sorts of photography goodness! Get My Ultimate Guide Now! This is one of the most important things. You need to serve your people and really think about what it is that they want and need. If you aren’t writing blog posts that are going to help people, ultimately your blog will not do very well in terms of subscribers. You need to decide who your target audience is and how you can help them. Figure out their age, their gender, their style, their likes, where they would shop, do they love coffee? Once you nail down who your target audience is, then you will be able to create blog posts around it. What do you wear for a photo shoot? Why did you start your photography business? Who has inspired you throughout your life? What’s your favorite social media and why? Share what apps you are currently obsessed with? How do you plan your content? How do you pack for a trip or photoshoot? My favorite calendar, journal, etc. Have someone do a guest post for you! What are the difficulties you’ve overcome in your business? What is in your wedding photography bag? What’s in your office bag? Create a massive list of blog post ideas! Why you became a photographer? – Tell your personal story! What is your expertise and your best work to prove it! Your favorite lens and why you love it so much? Why you chose the camera you shoot with? Local Vendors, you recommend and work with? A Behind The Scenes look at one of your shoots! (BTS) – This will give them an idea of what it’s like to work with you as a Photographer and also what can they expect! Who your ideal client is – This will help them know whether they are a good fit to work with you! How you edit your photos. Your before and after images – How you transform your images to a whole new level during your post-production & editing workflow. How you make your clients comfortable during the shoot. What’s your advice for brides & grooms to be? How you try to maintain a work-life balance? Do a Vlog! – A Video Blog. Get personal! Create an SAQ (Should Ask Questions) listicle! Blog about your offers, discounts, special events, etc. How you deliver images – How many images do you provide? Best alternatives to a guest book that your guests will love! How to hire a photographer for a proposal without your fiance knowing what is going on. The best wedding inspiration websites you’ve never heard of. (Good opportunity to get backlinks, find the smaller sites who appreciate the attention). How to share your photos with all of your guests, friends, and family. Top ways to encourage guests to put down their phones on your wedding day. After you’ve done a large number of weddings or photo sessions, do roundup posts of some of the best moments you’ve captured. Holy Crap! Ok, that is alot of information. Have you tried any of these? Leave a link in the comments below so I can read your blogs! Alright friends, Mother’s day is just around the corner! Now that mama in your life is also a badass photographer. What in the literal heck do you buy her? Well, that is where I come in. I have so many awesome ideas for you! This way it makes your life a little less stressful, you don’t have to worry about getting out and shopping, and you can be uber confident that you are getting her an amazing gift! Win Win Win. Ok so we have all heard it. Blogging is important. Is it really though? Do you really need to blog as a photographer? Why? What is so awesome about it? Is this just one of those things that everyone says because… well… everyone else is saying it? Today, I really want to talk about this subject. It has been something on my mind ever since I started by photography business. I started off my business with a blogging bang! I blogged once a week. It got me no where (or so I thought). So I stopped blogging. Then I started. Then I stopped. Then I just decided to do it whenever I wanted to do it. This year, I have decided that I am going to blog at least once a week consistently all freaking year long. Yep, that is what I am doing. Now, why I am sure you are asking. Why would I do that with my blogging history? Well, that is why we are here to chat. I have learned a freaking lot since starting my business 4 years ago. The struggle has been real and I really really really want to save you all that time. I want to just help you, and get you the answers you need, so you can start off with a huge BANG! Do Photographers Really Need a Blog? Now that the cat is out of the bag, lets chat about why it is important, why it isn’t a waste of time, and why you need to be consistent with your blogging. Why do Photographers need a blog? Ok, hear me out here. Please just read and really soak this in. DO NOT JUST READ THE HEADLINES (I am guilty of this, like all the time when reading a blog. I only read the highlights. You really need to see the reason behind why this is important). This is one of the BIGGEST things eva! What you need to ask yourself is “how are my clients going to find me?” If the answer is the internet then there you go. So, basically SEO is this big scary thing that you never knew was going to be part of owning a photography business. I mean you’re a photographer, not a SEO expert, but unfortunately you are going to need to become at least versed in SEO. For blogging purposes and to be relevant in a google search google wants to see that your website is providing new ideas/things on a regular basis. So the rule of thumb is 1 blog post a week. This way google knows that you are still ‘alive’ if you will. There is this article I was reading on the Huffington Post about the 1% rule. Only 1% of people are actually adding content to the internet on a regular basis. This means that if you just post a blog post on a regular basis you will be in that top 1%. How crazy is that? And yet, here we are being scared that the market is over saturated, that blogging is dead… pssschhhhttttt. Ya right! Along with that, you will establish yourself as an expert in your field by posting what you know. It will show people that you actually practice what you preach. That you actually do what you say you do. Let’s face it, Instagram can be tricky. There are so many people… well.. how do I say this….. there are so many people freaking faking it. Photos aren’t always real. When you start blogging about what you know, BOOM you have become an expert in your field. This will validate the photos that you share. Now this is the biggie! We started this business to stay in business right? So, we obviously need clients. If you blog, you become more relevant. You start showing up in google searches, on Pinterest, and pretty much all over the place. Then when your ideal client searches for a photographer, they find you rather than the people not putting out the time and effort to blog. Then your client checks your website. They see that you are active and posting all the time compared to other photographers in your area. They see your gallery, your work, they freaking love it, they contact you, and the rest is history. So there are two things here, Google and Pinterest. Blogging can be a form of marketing depending on how you use it. Blogging will also allow you to have ample content for Pinterest. Friends, if you aren’t on Pinterest what are you even doing? Do not walk, RUN! Go sign up right freaking now and get your bootay moving! P.s. if you want to follow me on pinterest you can find me here. For me, this is one of the most important. I want people to see who I am and decide if they like what I am all about. I do not want people contacting me just to find out that we aren’t compatible. Basically, this helps weed people out. Now, something that I have had to really freaking get to understand is that you can’t please everyone and that is ok. Seriously THAT IS OK. You want to attract your people, your tribe, your ideal clients. You also want to push away the people that you will not get along with. Maybe this sounds harsh, but you don’t want to work with someone who doesn’t value you, and they shouldn’t want to work with you either. They should want to work with someone who they can relate to. It will make the entire experience so much better! WOW THAT WAS ALOT OF INFORMATION!!! Now with all that being said, how do you know if you are doing it right? How do you know how often to blog? Answer: The rule of thumb is to blog once a week. You need to be consistent with your blogging. This is what will keep you relevant and help with your SEO. Now, that isn’t the only amount to blog. Do not be afraid to blog more often if you can. The key is to just blog, and blog consistently. Ok, ok I can already hear people… “but I don’t have enough content to blog”. Dude, I freaking get it! I really do. I was in the same boat, and totally felt the same way, hence my super ugly blogging history. Now, the key is to stay consistent. If you don’t have enough to blog about, then just make sure you blog consistently. Blog once a month if that is all you can do, but be consistent about it. Now, I am going to be real and brutally honest, because that is just who I am and what I do. Whatever the reason is, I am here to be your honest friend. You are making an excuse. You do have enough content, you just need to take the time to write it down. Get yourself a little book to carry with you always. When you come up with an idea, jot it down in your book. Then when the time comes to blog, you have a plethora of ideas to choose from. Also, once you start blogging, once you start getting into the groove of things, it actually does become easier. Seriously though, it really does. I’m not just saying that. Make sure to check out my blog on Tips + Tricks to Make Blogging Easier and Faster. Seriously though, blogging is pretty darn awesome and has so much dang potential. It really depends on how much effort you put into it! I hope you all enjoyed this blog! If you did, leave me a comment below, or even better, share it with your friends! Wishing you the absolute best!